IT’S BEEN CALLED the Merkel mystery: How did a pastor’s daughter who once marched in the uniform of East Germany’s communist youth end up leading a conservative, male-dominated party from West Germany to become the country’s first female chancellor? With Angela Merkel favoured to win Sunday’s national elections, observers at home and abroad are once again puzzling over the reasons for her success. Is it her doctorate in natural sciences that gives her an edge when it comes to solving problems? Or does the experience of watching the state in which she grew up collapse mean she takes nothing for granted? One point most pundits can agree on is that almost all of Merkel’s opponents have underestimated her from the moment Chancellor Helmut Kohl picked her for his first Cabinet just a year after she entered politics. “She didn’t start at a local level. She went straight to the Cabinet table,” said Jacqueline Boysen, her biographer. Everyone thought this was because she was young, she was a woman, she was from the east and she wasn’t involved with the regime there. But things weren’t that simple because she proved that it was a place she was suited for. She found that she was talented and enjoyed politics. Merkel is now widely regarded as Europe’s most powerful leader. Comparisons have been drawn with Catherine the Great, the German-born czarina who ruled Russia in the late 18th century and whose portrait graces the chancellor’s otherwise spartan office. Both women grew up in the Prussian heartland, northeast of Berlin, displaying a sharp mind from an early age. And both were prepared to be ruthless in their pursuit of political power. While Catherine reputedly had her husband Czar Peter III murdered, Merkel famously turned on Kohl, her long-time mentor, after he became embroiled in scandal. 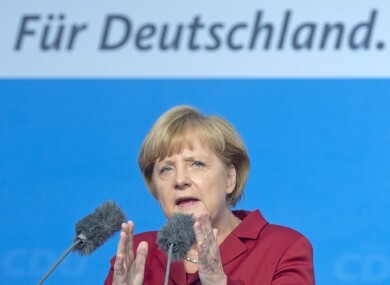 Some observers have accused Merkel of having no grand vision. With the exception of her abrupt 2011 decision to phase out nuclear power within a decade, Merkel has been wary of pursuing major projects. “I think that Mrs Merkel doesn’t think that political visions are the task of a chancellor,” said Ralph Bollmann, a correspondent for the conservative Frankfurter Allgemeine Zeitung newspaper. She’s accused of having no convictions and being super-pragmatic. I would say that it’s precisely that pragmatism that’s her biggest conviction. To make that point, Merkel whipped out her party’s traditional slogan — “No experiments” — at an election rally last week in the western city of Dusseldorf. The chancellor is hoping voters will see things the same way come tomorrow. Still, mindful of an unexpectedly narrow victory in 2005 and stung by her party’s loss of an important German state earlier this year, Merkel has downplayed recent polls that put her coalition in the lead and warned Germans that they could wake up with the ex-communist Left Party in government if they don’t vote for her. Can she switch off from the job? The ‘Merkel Diamond’ trademark gesture has become so well known that the hands of the new wax figure of German Chancellor Angela Merkel at Madame Tussauds in Berlin, Germany, shows it. Pic: Markus Schreiber/AP/PA Images. The motherly reference to Merkel, who has no children of her own, was once used by her enemies to poke fun at her dowdy demeanour. With two terms behind her, “Mutti” — “Mommy” — has become a term of endearment and familiarity. “Germans feel they don’t have a whole lot to lose if things just stay the same,” says Juliane Mendelsohn, a columnist who lectures at Berlin’s Free University. That hasn’t been the response that has greeted Merkel on her trips to Greece, Cyprus and Italy, where her demands for national belt-tightening have provoked fierce popular anger and accusations of Nazi-style imperialism. Talk of austerity has been largely absent in her campaign for re-election. Instead, Merkel has promised to spend billions expanding state childcare, increasing pensions and improving Germany’s autobahn network. But on her election website, Merkel appears keen to show that she is prepared to impose austerity even at home. Her husband, a noted chemist, rarely complains about her cooking, the website says. “But my cakes always have too little streusel for his liking,” Merkel is quoted as saying, referring to the butter, sugar and dough flakes traditionally sprinkled on German fruit cakes. Email “How Angela Merkel rose to the top job in Germany”. Feedback on “How Angela Merkel rose to the top job in Germany”.